Fred Hawke was a well-known photographer who lived in Hallaton all his life. He was the post-master and ran the village post-office. He toured round the villages close to Hallaton on his motorbike taking photgraphs of village life in the early 1900s up to the 1960s. The station is believed not to be Hallaton itself, as that station did not have the three apexes roof. We need all the LNWR - GNR Joint Line fans, to "come out of the closet" on this one! The sun indicates a northbound train, as afternoon is the most likely time. The Platforms are wooden. So which stations on that Joint Line would fit best? I have a copy of LNWR Track Diagrams no. 5 Northamptonshire, and of the LNWR maintained stations. John O' Gaunt would seem to be the most likely. But then there are all the GNR maintained stations north of Melton Mowbray, which are not in that book! This looks very like King's Cliffe station on the Market Harborough to Peterborough branch, looking east. King's Cliffe is about 14 miles east of Hallaton. Try Wakerley and Barrowden station on the Seaton to Peterborough line. In the book Past and Present East Midlands by Chris Milner and Chris Banks there is a picture taken in 1955 from the opposite direction but there is enough to suggest it is the same location. The 'Present' photograph in the book was taken in 1989 and the main station building is still standing, albeit without canopies. The photo is end-on though, and there is much shrubbery, so it doesn't allow much comparison with the mystery photo. There is a good chance that this building is still there so the architecture could still be compared. I am partially answering my own question here! I have now browsed LMS Journal no. 16, in which there is an article by a Joint Line engineman, Jim Jackson. The station is definitely not John O' Gaunt. In the article is a photo taken at Redmile, which is similar but different, to the Mystery Photo. Now it is not Harby & Strathern nor Melton Mowbray, but I am taking the view that from Melton Mowbray northwards, the station buildings are more likely to be GN-style with those distinctive roofs. As it is an LNWR stopping passenger train, it would have to be heading for Nottingham. So that just leaves four stations, Scalford, Long Clawson & Hose, Barnstone and Bingham Road, to choose from! Harry & Graham's comments simply give us more places to look. Another line that might have had some of those distinctive awnings, is the Northampton & Market Harborough Branch, again not that far from Hallaton. But I have no intimate knowledge of the area, I was brought up in Cheshire! If we "exhaust" our LNWR sources, then we could perhaps contact our chums in the Great Northern Railway Society. Kingscliffe looks right - see attached scan which is from an Edwardian period postcard. Kingscliffe had a curve through the station, but Wakerley & Barrowden didn't. Both were opened in 1879 so presumably their "3-apex" roof was a standard (short-lived?) LNWR pattern at that time; I don't know if the other station on the branch, Nassington, had a similar roof, but it also seems to be on a straight piece of track - according to the 1" OS map - so can be excluded. None of the Northampton - Market Harborough branch stations seem to fit, according to the photos in John Gough's 1984 history of the line. This is definitely King�s Cliffe Station. 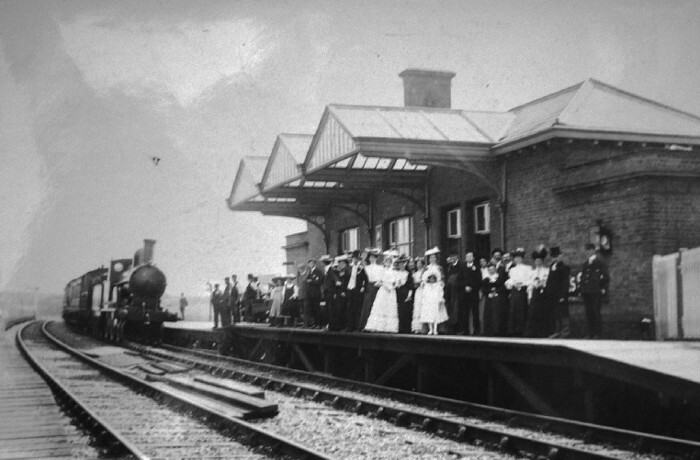 We have quite a few photographs in the King�s Cliffe Heritage archives of the Station - both with and later without the three-apex roof - including the one posted on the website by John Alsop. The train is heading eastwards towards Peterborough and the wedding party is on the Up platform. The wedding is believed to be that of the stationmaster's daughter, Gertie. He was William Dean. Many thanks to all who helped to identify our mystery photograph. Thanks to the suggestions given on your website we visited Kings Cliffe and were put in touch with Sue Trow-Smith who was able to identify not only the station but also the wedding party. Our railway exhibition Before Beeching won an award in 2007 so it is to remain through 2008 and the story of the mystery photograph and the LNWRS involvement will be included in the exhibition. I'm glad the location is now confirmed (and the identity of the bride!) - but the approaching train which the happy couple may be about to board is heading west, from Peterborough and towards Market Harborough; this is shown by the curve of the track.